The Peregrine is a majestic bird, most known for its use in falconry. After the effects of a DDT poisoning in the 1950s, the Peregrine was seriously endangered but now is a stable breed. Adults have horizontal bars on their breast. Juveniles differ in that they have vertical lines and are heavily marked. The feathers on the falcon give the bird a long-winged shape, distinguishing it from other birds of prey. Classified as one of the world’s fastest birds, the Peregrine Falcon can hit a top speed of around 200 miles per hour when striking down to get their prey, making it the fasted member of the animal kingdom. You can find the Peregrine nesting in tall structures, whether it be skyscrapers on cliffs. The Peregrine is more inclined to stay to coastal regions but can also reside in the tundra or desert, as long as they have wide-open spaces to scout out their prey, which consists of smaller birds and bats. A peregrine falcon can dive up to 200 miles an hour to capture prey in flight, striking in midair with its outstretched talons, or claws. 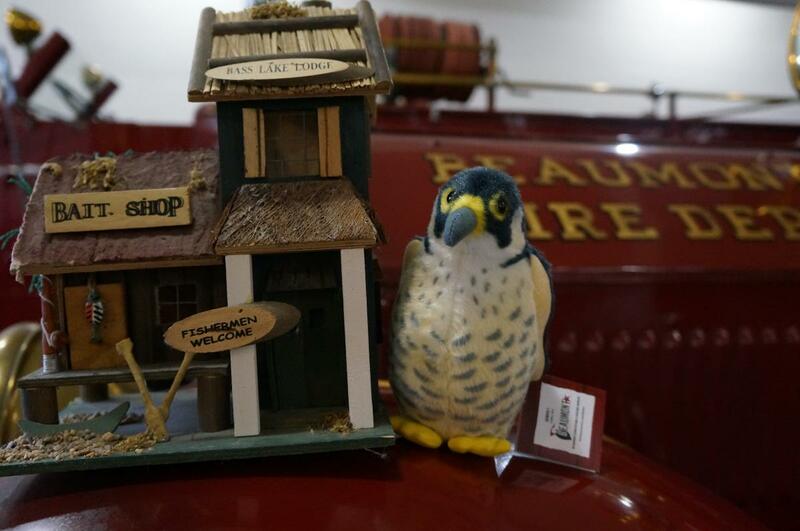 The Fire Museum of Texas is recognized as one of Texas’s Best FREE places for individuals, groups and families to visit. Get a hotel discount with a welcome bag at check-in. 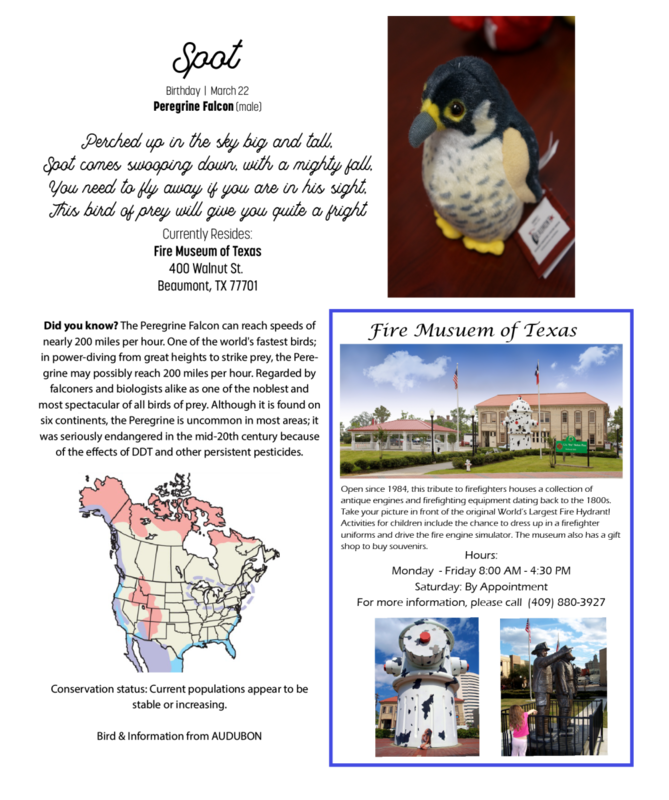 Includes Beaumont Birding souvenir book, trail maps, birding checklist, itinerary, and an exclusive Beaumont Birdie! Within a 40-mile radius, you will find the wild coastal shore of Sabine Pass and Sea Rim State Park, the meandering bayous of the Anahuac Wildlife Refuge, and the thick forests of the Big Thicket and Piney Woods. Birders Welcome! Birding Checklist comparing 7 of 28 Great Texas Coastal Birding Trails within a 40 mile radius. Beaumont is on two migratory flyways & over 350 bird species are spotted around Beaumont annually. Enjoy the live stream from Cattail Marsh Wetlands Boardwalk!